This was like mandatory, either there were pakoras (fritters) or samosa or vadas. Basically anything spicy, fried and crispy. We Indians do love our fried stuff. Chai time is often incomplete without them. During the fasting time of Navratri, my dad kept fast for all 9 days. And so during that time mom made these sabudana vada for our chai. 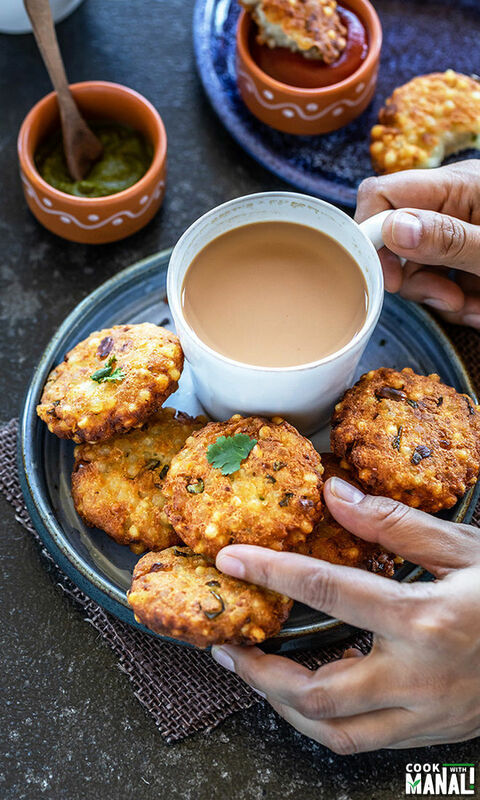 These crunchy vadas are made with sabudana (sago), potatoes and peanuts! They are very lightly seasoned but taste amazing. 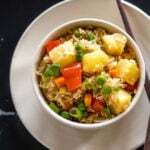 Just like sabudana khichdi, these are easy to make but there are few things which you should keep in mind while making them. 1. Make sure to soak the sabudana well in advance. I prefer overnight but 4 to 6 hours will also do. It also depends on the quality of sabudana, some take more time than the other varieties to get soft. I always soak mine overnight. 2. Use 1:1 sabudana to water ratio to soak the sabudana, just like we do in the khichdi. 3. 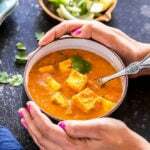 Once the sabudana is soaked, make sure it’s perfectly softened. Place sabudana between your thumb and index finger, you should be able to crush it easily. That’s perfect and that’s what you want. 4. Use a mortar and pestle to crush the roasted peanuts. I usually first roast the peanuts in a pan on low-medium heat, them remove the skin and them crush in a mortar pestle. 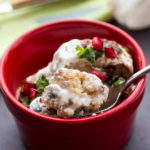 For this recipe, I did put them in a spice grinder and it was a little too fine for my liking. 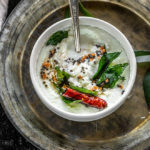 You want those chunks of peanuts in there, that’s what gives the vadas a nice texture and crunch (and of course taste!). 5. Fry the vadas on medium heat. If you fry them on high heat, they will get brown from outside quickly but will remain uncooked from inside. Also if the oil is cold, they will adsorb lot of oil and become very oily. So, make sure to keep the temperature of the oil to medium. 6. Don’t overcrowd the vadas in the kadai/wok while frying them. Give them enough space to fry well from all sides. 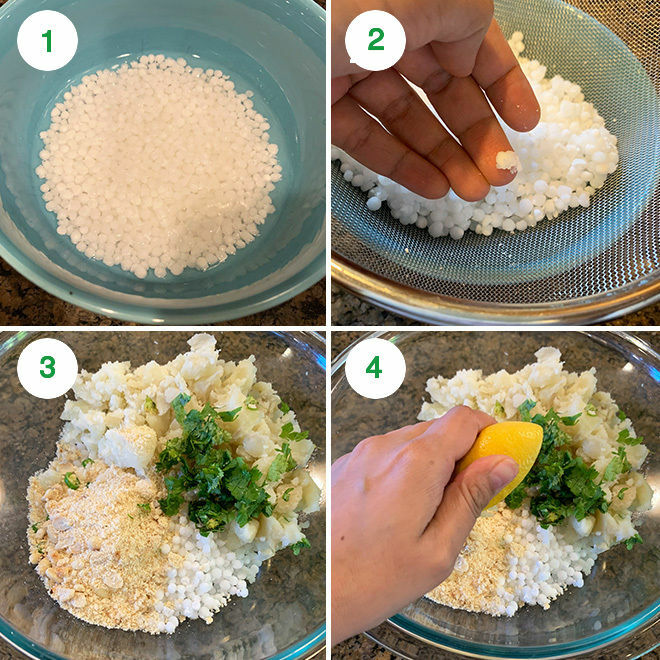 If you follow these steps, you will end up with the most crispy and yummy sabudana vada. Serve them with chutney, ketchup or whatever you like. And a cup of chai is obviously must. 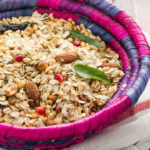 If you are making this for fast, follow the same recipe except use sendha namak (rock salt) in place of regular salt. 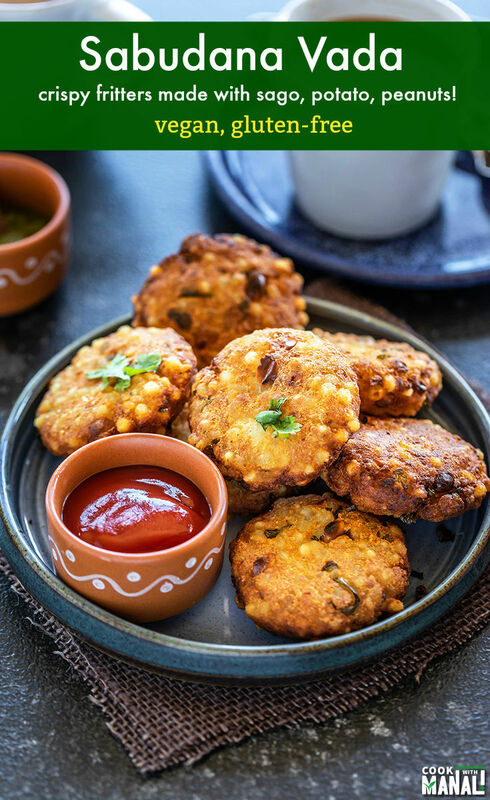 The great thing about these vadas is that you only need a few ingredients to make them and the results are amazing. Once you have the sabudana soaked, it’s only a matter of boiling the potatoes and frying them. 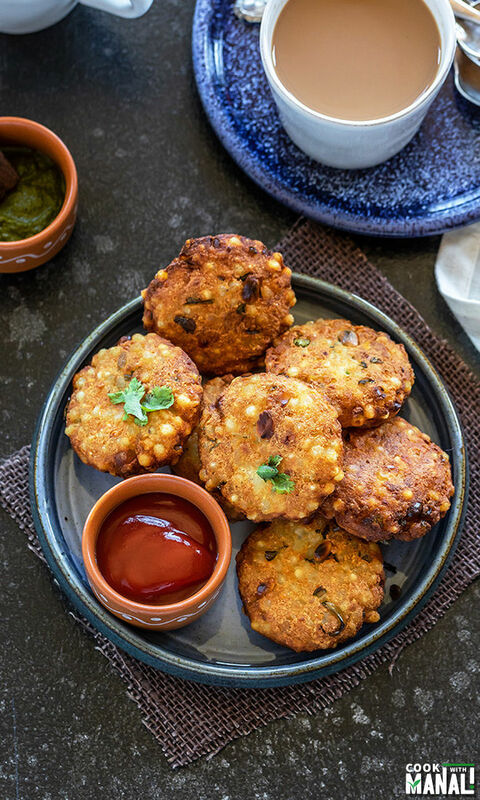 TIP: In case, your vadas are breaking in the oil, you may add some kuttu flour (buckwheat flour) or regular flour or cornstarch to bind them. I did not add any, the potatoes were perfect enough for binding. 1- Rinse sabudana well until water turns clear. Soak it in 1/2 cup water overnight (or 4 to 6 hours depending on quality of sabudana). 2- In the morning, the sabudana would have absorbed all water. It should be soft, press with a finger to check, it should crush easily. Drain sabudana in a colander, most likely there will be no water but still drain. 3- Then transfer the saubdana to a large bowl along with boiled potatoes, roasted peanuts, cilantro, green chilies. You may also add ginger if you like or even mint. 4- Add lemon juice and salt. 6- Divide the mixture into 10 equal parts, flatten them a bit and make them round shape. I got 10 vadas, around 50 grams each, 2 inch in diameter. 7- Heat oil on medium heat in a kadai or wok. Add vadas to the oil one by one, don’t overcrowd the kadai. Maintain the oil temperature to medium heat. 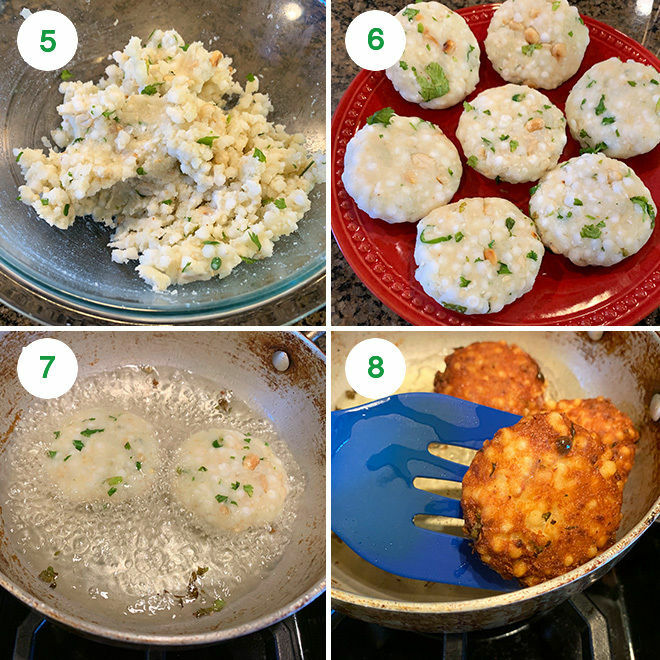 8- Fry vadas on medium heat until golden brown and crispy from both sides. Drain on paper towel. 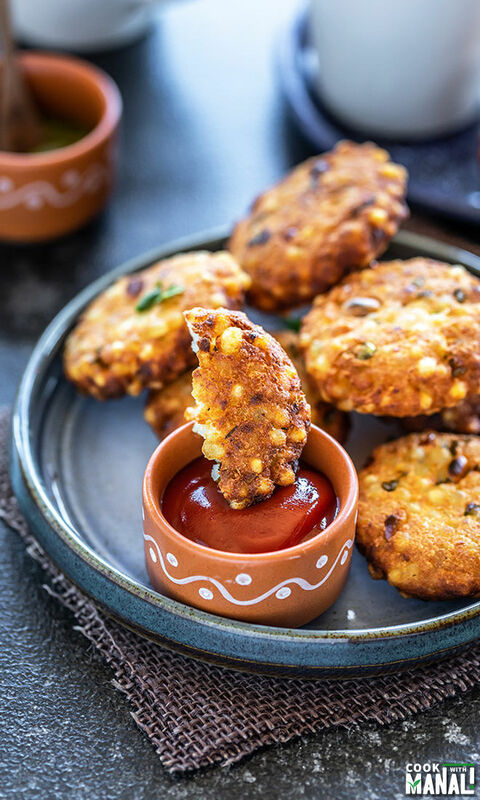 Serve sabudana vada with chutney, ketchup or anything that you like. 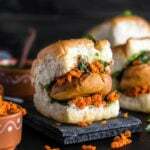 If you’ve tried this Sabudana Vada Recipe then don’t forget to rate the recipe! You can also follow me on Facebook and Instagram to see what’s latest in my kitchen! 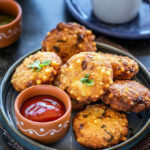 Crispy Sabudana Vada are fritters made with sago, potato and peanuts! 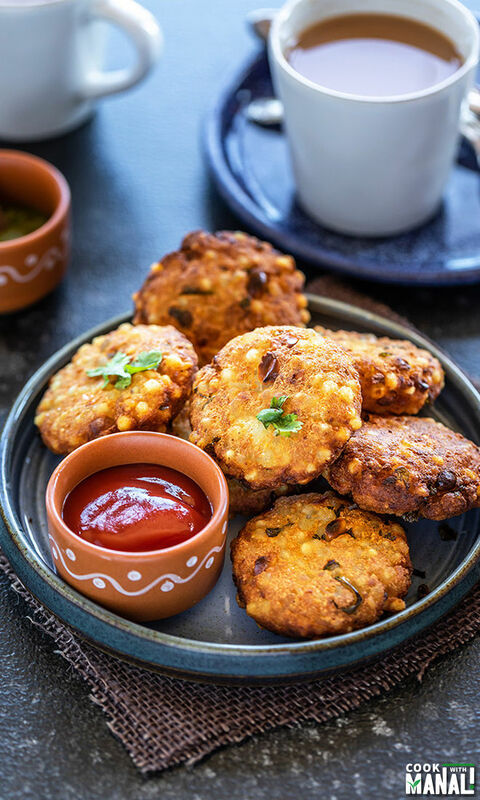 These fried vadas are great for snacking or to serve as an appetizer. Vegan & gluten-free. Rinse sabudana well until water turns clear. Soak it in 1/2 cup water overnight (or 4 to 6 hours depending on quality of sabudana). In the morning, the sabudana would have absorbed all water. It should be soft, press with a finger to check, it should crush easily. Drain sabudana in a colander, most likely there will be no water but still drain. Then transfer the saubdana to a large bowl along with boiled potatoes, roasted peanuts, cilantro, green chilies. You may also add ginger if you like or even mint. Add lemon juice and salt and mix everything together. Divide the mixture into 10 equal parts, flatten them a bit and make them round shape. I got 10 vadas, around 50 grams each, 2 inches in diameter. Heat oil on medium heat in a kadai or wok. Add vadas to the oil one by one, don't overcrowd the kadai. Maintain the oil temperature to medium heat. Fry vadas on medium heat until golden brown and crispy from both sides. Drain on paper towel. In case, your vadas are breaking in the oil, you may add some kuttu flour (buckwheat flour) or regular flour or cornstarch to bind them. I did not add any, the potatoes were perfect enough for binding. You can also pan fry these vadas if you don't want to deep fry. Heat enough oil in a pan and cook until vadas are golden brown and crisp from both sides. 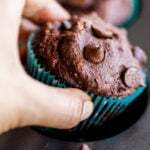 I am one of the great fan of your recipes. And I couldn’t stop myself to drop these few lines again. 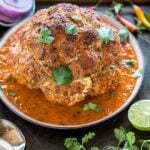 Your all recipe are simple and great.